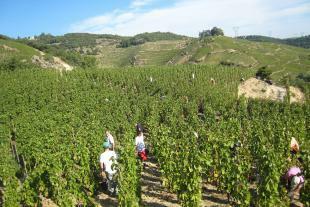 The Hauts Châssis estate is in the middle of the locality called "Les Hauts Châssis" in the south of the Crozes Hermitage appellation area. It has been in existence for 3 generations and the current owner Franck FAUGIER has been the winemaker since 2003. The equipment is modern (stainless steel vats) but the estate is run with an eye to tradition. Franck prefers mechanical soil cultivation methods, reasoned pest control, green harvesting and leaf-stripping by hand. Maturing is adapted to the structure of the grape. Wine Spectator 90 "A fresh, pure style, with a beam of raspberry pâte de fruit enhanced by light savory, pepper and chalk hints. A light briary echo shows on the finish. Drink now through 2017. 850 cases made." The Hauts Châssis estate is in the middle of the locality called "Les Hauts Châssis"